Russia became China’s largest supplier of crude oil on an annual basis in 2016, dislodging Saudi Arabia from the position it had held every year since 2001 (except for 2007 when Angola occupied the number one slot). Russia will almost certainly remain a major oil supplier to China for at least the next decade for reasons of infrastructure, supply deals and politics. However, Russia will likely face competition from other oil exporters seeking to sell more to the world’s largest net oil importer. In 2018 and 2019, Brazil, Iraq and the United States are likely to increase their shares of China’s crude oil imports, while Angola, Iran and Saudi Arabia may not fare quite as well. 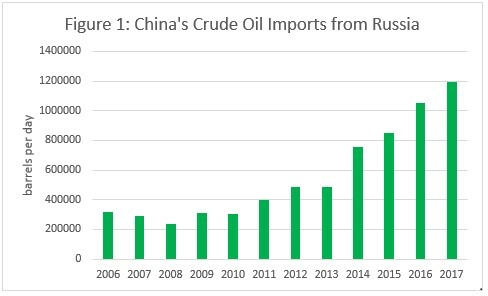 China’s imports of Russian crude oil have nearly quadrupled in less than a decade, increasing from 320,000 barrels per day (bpd) in 2010 to 1.2 million bpd in 2017 (see Figure 1). No other country ranked among China’s top ten crude oil suppliers in 2017 experienced an increase of comparable volume. Russia’s deliveries to China topped 1 million bpd for the first time in 2016, when it became China’s largest supplier of crude oil on an annual basis. Russia retained its position as king of China’s crude oil imports in 2017, when it increased its exports to China by 13.8%. Pipeline Construction: Over the past decade, Russia and China developed the pipeline infrastructure necessary to deliver large volumes of crude to China. The so-called Skovorodino-Mohe spur of the East Siberia Pacific Ocean (ESPO) pipeline is comprised of two parallel pipelines running to the Chinese border for onward delivery to Daqing. The first line commenced operations on January 1, 2011 and the second began deliveries on January 1, 2018. Together the spurs have the capacity to transport 600,000 bpd. Meanwhile, Russia completed the second stage of the ESPO pipeline, which stretches from Skovorodino to Kozmino on Russia’s Pacific Coast, in 2012. This line has a capacity of one million bpd, of which 640,000 bpd go to Kozmino. 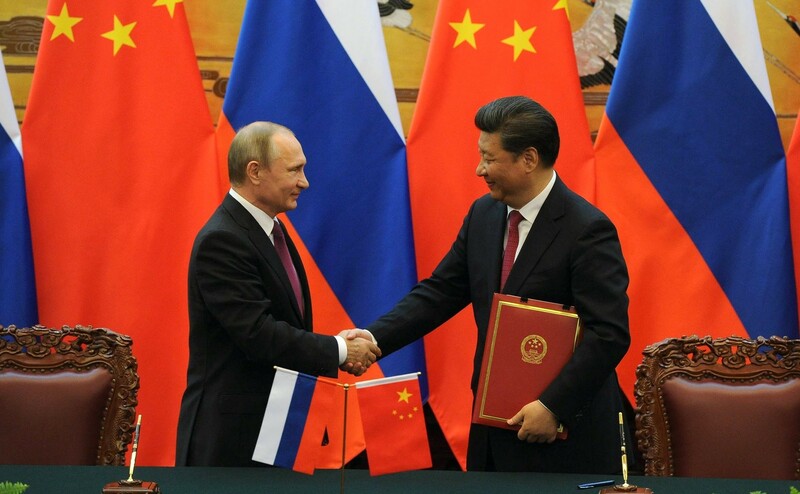 Long-term Supply Contracts: China and Russia also inked two long-term supply agreements, both of which were partially motivated by Russian energy companies’ need for cash. In 2009, the global financial crisis and the oil price collapse set the stage for China Development Bank to extend $25 billion in credit on very generous terms to Rosneft and Transneft, both of which had looming debt payments. In exchange, Transneft agreed to construct the first ESPO spur and Rosneft agreed to ship of 300,000 bpd of crude through the pipeline for 20 years. In 2013, Rosneft once again sought capital from China to ease its debt burden, which grew considerably after its purchase of Russian producer TNK-BP for $55 billion. Rosneft agreed to send China an additional 300,000 bpd for 25 years in exchange for prepayment for a portion of the oil, which was valued at $270 billion based on the price of oil at that time. In January 2018, private firm CEFC China Energy began receiving 240,000 bpd of crude from Rosneft as part of a five-year supply agreement. Emergence of New Chinese Buyers: In 2015, Beijing granted China’s independent refineries, most of which are located in Shandong province, direct access to imported crude. This change in policy essentially created a new country’s worth of crude oil import demand, with Beijing awarding the independent refineries import quotas totaling 1.5 million bpd in 2016 and 1.9 million bpd in 2017. Russia quickly became a popular crude supplier to the independent refineries because the short transit distance from Kozmino (compared to Persian Gulf ports) to Shandong makes the smaller cargoes they prefer economical. The independents purchases of Russian crudes accounted for more than 90 percent of the growth in Russian exports to China in 2016 and all of the growth in 2017. Meanwhile, other major exporters, notably Saudi Arabia, were slower to engage with the independent refineries. First, there is a mismatch between Saudi Aramco’s practice of selling large volumes of crude via long-term contracts of a year or more and the independent refineries’ preference for purchasing smaller volumes on the spot market due to infrastructure and financial constraints. Second, Aramco was not as flexible on pricing as other oil exporters selling to the independents. Third, Aramco was initially cautious because of concerns about the independents’ creditworthiness. Saudi Production Cuts: Saudi oil production cuts have constrained the ability of the kingdom to compete for a larger share of China’s crude oil imports. In late 2016, Saudi Arabia pledged to reduce its oil production by 486,000 bpd from its October 2016 level of 10.54 million bpd as part of an agreement between members of OPEC and other oil producers, including Russia, to reduce the glut of oil on the world market and put upward pressure on prices. The Kingdom contributed by more than any other party to the agreement, reducing its oil output by an average of 460,000 bpd in 2017. As a result, its crude oil exports to China only increased by 2.3 percent. In contrast, Russia’s commitment to decrease its oil production by 300,000 bpd did not stop it from increasing its exports to China by 13.8 percent. First, the baseline for Russia’s cut was its record-high output level in October 2016. As a result, Russia’s averaged annual oil production increased modestly in 2017. Second, Russia diverted oil exports from West to East to honor its supply agreements with China (despite that in doing so this has compromised the quality of Europe-bound Urals crude deliveries). Russia, currently the world’s largest oil producer, is likely to remain a top supplier to China for at least the next decade. This is not only because of the infrastructure and long-term supply contracts but also because of the importance of the two countries to each other’s oil security. For China, Russia is the country that has done the most to help China diversify its oil supplies away from the sea-lines of communication and major maritime chokepoints including the Strait of Hormuz and the Strait of Malacca, providing 14.2 percent of China’s crude oil imports in 2017. In contrast, Kazakhstan –China’s other overland supplier — only exported 50,000 bpd to China last year because of production declines in the region where oil for the Kazakhstan-China pipeline is sourced. Russia is taking advantage of the considerable spare capacity in this 400,000-bpd pipeline to deliver 200,000 bpd to China. For Russia, China is central to its efforts to diversify its oil exports away from Europe, where oil demand is projected to decline. The International Energy Agency expects that between 2016 and 2030, Europe’s oil demand will fall by while China’s will increase by 3.9 million bpd. Moreover, Russia’s energy relationship with China is arguably even more important to Moscow in light of frictions in Russia’s relationship with the West. While Russia appears poised to remain at or near the top of China’s list of crude oil suppliers, other major oil exporters will still compete to expand their shares of China’s increasing crude oil imports. 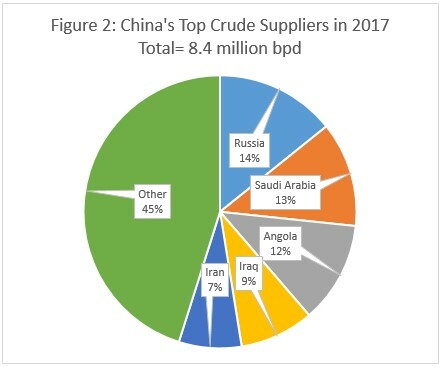 This section assesses the prospects of China’s four largest oil suppliers after Russia in 2017 (see Figure 2), Brazil (which saw its crude oil exports to China grow by 20.5% in 2017) and the United States (which the International Energy Agency says is likely to become the world’s largest oil producer and one of its top exporters in the next five years). Brazil: Brazil is well positioned to gain additional market share in China. Brazilian deliveries to China are likely to increase due to expected growth in the country’s oil output, including at fields in which China’s national oil companies are invested, and a push to diversify Brazil’s oil exports in light of the United States’ declining imports. 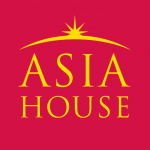 Iraq: The country’s state oil marketer has said it wants to win a greater share of Asian markets, including China. Iraq’s large, low cost reserves and willingness to undercut Saudi Arabia on prices should help it vie for a larger share of China’s crude oil imports. However, fighting in northern Iraq, which contributed to volatile production in 2017, will probably remain a headwind to production and export growth. USA: More and more US crude is likely to be shipped to China as American oil production and exports continue to boom. Since Washington lifted its ban on crude oil exports in 2016, China has emerged as the second largest buyer of US crude behind Canada. China imported 224,000 bpd of US crude in 2017, and Sinopec, China’s largest refiner, has said it expects to buy 300,000 bpd of US crude by end-2018. Angola: Although Angola’s oil exports to China increased by 15.3% in 2017, such growth will be difficult to replicate in 2018 and 2019. Angola has struggled to boost its production, which peaked in 2008, in part because of inadequate foreign investment and aging fields. Iran: Iran’s efforts to increase its market share in 2018-2019 will almost certainly be constrained by a lack of foreign investment. The amount of foreign spending in Iran’s oil patch since the 2016 nuclear deal has fallen far short of what Tehran had expected. While Chinese firms have contributed some capital, it has not been enough to lift Iran’s oil production. Saudi Arabia: While the Kingdom is keen to regain market share lost in recent years, its ability to increase crude oil exports to China in 2018 is likely to be limited by the ongoing OPEC-led supply cuts. However, Saudi Arabia is likely to continue its pursuit of more joint venture refineries in China, which would allow it to “lock in” a larger portion of its crude deliveries to China. Erica Downs is a senior research scientist in the China Studies division of CNA Corporation and a non-resident fellow at the Center on Global Energy Policy at Columbia University. This article reflects her personal views and not those of any institution with which she is affiliated. Image credit: CC by Press Service of the President of Russia.